The information below will not be new to most Pakistani defence enthusiasts, especially those following the development of the JF-17 Thunder, the Pakistan Air Force (PAF)’s new mainstay multi-role fighter. That said, all of what you are about to read on this article is verified information acquired through a Defence Industry Bulletin interview (during the 2015 Paris Air Show) of Air Commodore Khalid Mahmood, the Vice-Director of the JF-17 program and its sales and marketing manager. Though I will not repost the interview here, I will note and discuss the key details. AC Mahmood told Defence Industry Bulletin (DIB) that the PAF had 50 JF-17s in service with three operational squadrons. He was referring to the No. 26 and No. 16 squadrons based out of Peshawar Air Base, the third unit he was referring to is the Combat Commanders School (CCS). CCS is the PAF’s training arm for experienced pilots who have shown considerable promise and aptitude for assuming operational leadership posts (such as commanding a fighter squadron). AC Mahmood also noted that a fourth squadron would be raised “within [the] year”, this would be the recently re-equipped No. 2 squadron operating from PAF Masroor. Alongside the operational units there are also 10 JF-17s committed for testing and development, these are in use in Pakistan as well as in China. As one might imagine these units are being used for testing new subsystems, such as radars and avionics, among other things. The JF-17 was formally inducted with CCS on 26 January 2015. 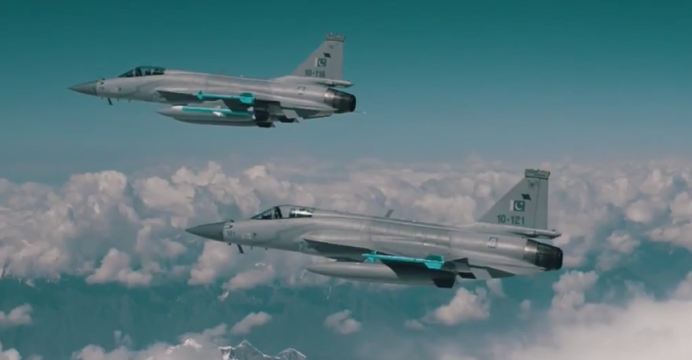 AC Mahmood confirmed to DIB that the JF-17 had seen use in the Federally Administered Tribal Areas (FATA), where “it has employed both guided and unguided munitions.” In other words, the JF-17’s precision-strike capabilities have been tested and put to use. I imagine the JF-17s were primarily using laser-guided bombs, likely LT-2, but I would not discount satellite-aided LS-3 and LS-6 munitions either (see this piece for an overview of the JF-17’s munitions inventory). It is likely that the JF-17’s LGBs have been paired with the Chinese WMD-7 targeting pod (Defense News). Indigenous data-link network in use? If you are not familiar with the concept, a data-link network basically enables various assets to communicate and exchange information from their sensors in near real-time. For example, an Airborne Early Warning and Control (AEW&C) aircraft could pick up incoming enemy aircraft and, nearly instantly, pass that exact information (with continuous updates) to friendly fighters. The network environment gives your side a live “picture” of the battlefield situation, enabling every friendly actor on the field to have an accurate and constantly up-to-date understanding of the situation. The PAF uses the American Link-16 system with its F-16s, though it is not entirely clear if the Erieye AEW&C is equipped with Link-16. That said, it should be noted that Saab listed Link-16 (along with Link-11 and an “in-house data link”) as an option. Besides mentioning that “the national solution” was working “okay”, the system in question was not elaborated upon. It is no secret that the JF-17 was slotted to be a network-centric platform, but it was not clear exactly how the PAF would achieve it. Would it import a data-link network that could be interoperable with Link-16? Or would it use two completely separated solutions (which could be relayed between one another by AEW&C)? The use of a “national solution” can be a significant thing, assuming what is meant by “solution” is the actual network itself. I personally would consider this feat to be of paramount importance given how network-centric warfare is the norm in modern warfare. Pakistan Aeronautical Complex (PAC) is on-track to produce 20 JF-17s (approximately a little more than a squadron) a year for the PAF, but the rate can be increased to 25 a year. It seems the gap was left in anticipation for export orders. The workshare agreement in effect between China and Pakistan permits PAC to produce 58% of the airframe and subsystems (the engine is imported from Russia). I imagine (and hope) the balance will gradually shift more to the Pakistani side as PAC becomes more capable. The JF-17 production line at Pakistan Aeronautical Complex (PAC), Kamra. AC Mahmood confirmed that the No. 2 squadron from Masroor would be equipped for anti-ship warfare (AShW). However, there are some caveats, primarily owing to the JF-17’s inherent structural limitations. 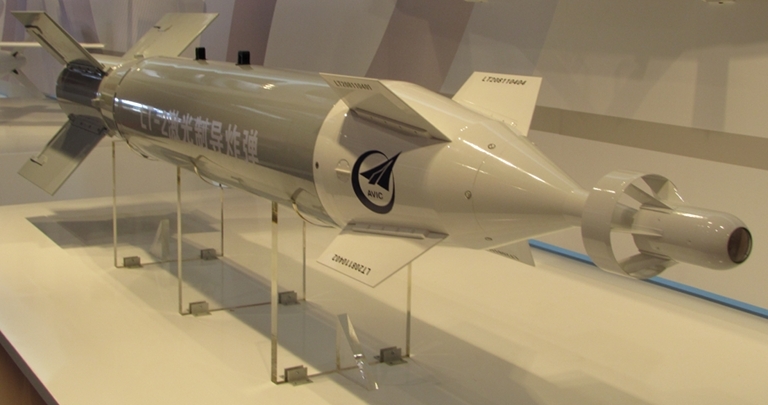 The C-802 anti-ship missile (AShM) in use with by PAF is a heavy missile, and as a result, the JF-17 will carry just one AShM in a mission, with the remaining hard-point stations reserved for fuel-pods and air-to-air missiles. I suppose in-flight refuelling could help address this issue somewhat by alleviating the needs for the tanks, but this does not change the reality of the JF-17 being a lightweight fighter. The need to address the maritime theatre with a heavier and longer-range fighter was one of the purported reasons why the PAF was reportedly looking at the Sukhoi Su-35 from Russia. The twin-seat variant of the JF-17 is under development and will be available as an operational conversion or training unit for prospective customers. However, AC Mahmood did not have much more to say about this variant. In other words, the two-seater is just poised be a training unit, not a specialized system for strike or dedicated electronic warfare. I imagine the reason, again, has to do with the reality that the JF-17 (at least the Block-1 and Block-2) is a lightweight fighter. The JF-17 Block-2 airframe is virtually identical to that of the Block-1. The only external difference between the two is the Block-2’s incorporation of a fixed in-flight refuelling probe (which will be in effect from the 24th or 26th Block-2 aircraft produced). According to AC Mahmood, the JF-17 did not have enough room for a retractable probe. The probe is being sourced from a South African company and is being integrated onto the starboard (i.e. right) side of the fuselage. In-flight refuelling is an important addition, it will enable the JF-17 to loiter for extended periods of time, utilize hard-points otherwise used for fuel pods for weapons, and travel without having to land and refuel on the ground as frequently as today (for reference the JF-17 unit made a total of six stops on their way to the Paris Air Show). The PAF’s current aerial refuelling cadre is composed of 4 IL-78 Midas tankers. A JF-17 Block-2 unit, fresh off of the production line. Although the refueling probe was the only external addition, the PAF is contemplating the idea of adding hardpoints under the fuselage chin area, which would be used for dedicated targeting pods such as the WMD-7. Internally the Block-2 is equipped with an improved electronics suite. This includes the avionics and electronics warfare (EW) suite (which may involve the Spanish firm Indra) as well as an updated version of the KLJ-7 radar known as KLJ-7 V2. That is right, AC Mahmood explicitly mentioned the KLJ-7 V2. If you have been following the JF-17 through defence enthusiast circles you will have come across the V2 quite a bit, but mostly through independent defence news sources. It is not entirely clear exactly what range improvements were wrought with the KLJ-7 V2, but it could be (though not confirmed officially) in excess of 100km at 3m2 RCS. Although the JF-17 Block-3 has been discussed in detail, including on this very website, it helps to know exactly what has been confirmed and what has not. AC Mahmood has confirmed that an Active Electronically Scanned Array (AESA) radar is being pursued, with the Chinese vendor Nanjing Research of Electronic Technology (NRIET) among the options being studied. The inclusion of an AESA radar would be a significant jump for the JF-17 (see here as to how and why), but a few important assumptions need to be made about the JF-17 Block-3, especially if the PAF intends to make it a substantive improvement over Block-2. One of the general challenges with AESA radars is the impact these radars can have on weight and power consumption in the fighter. If the PAF intends to include AESA radars with the intention of maintaining or even improving the radar detection and engagement range of the Block-2, it will need a lighter airframe and more powerful engine. While AC Mahmood did not confirm that a new engine will be used on JF-17, he did confirm that the PAF was studying its options, and that “the best equipment will find its way into the aircraft.” I think in the end the PAF would choose either the Russian RD-93MA or Chinese WS-13. In any case, I firmly hope the Block-3 makes much greater use of composite materials and a new engine, these essentials would set up the Thunder to be up to task for most of the aerial threats facing the PAF. A larger and more powerful aircraft might also open up the doors to special warfare variants, such as strike and electronic warfare. At its most basic level, an Infrared Search and Track system is an infrared energy detection device that is usually fitted in a spherical glass enclosure on the front of a fighter aircraft. The systems scans the airspace ahead of the jet for heat signatures caused by aircraft engines and/or skin friction caused by the aircraft flying through the air. Once the system detects a target, it usually has an ability to lock that target up, or a way to facilitate the crew in slaving their fighter’s radar onto the point in space where that heat signature exists in order to attempt a radar lock. Modern variations of IRSTs can search out to intermediate ranges, track multiple targets and even engage other aircraft using its telemetry data alone. It should be apparent from the explanation above that IRST is in effect an alternative to using radar for aerial detection and engagement. Why would not use their radar? Well, radars are susceptible to detection by an opposing aircraft’s radar warning receiver (RWR) and electronic jamming by EW suites (and potentially even AESA radars). IRST can resolve that issue, and modern air forces around the world have caught on, particularly the Europeans (the Dassault Rafale, Eurofighter Typhoon and Saab Gripen all include IRST). The Americans are also pushing forward with Lockheed Martin’s Legion pod. For the PAF I think the inclusion of IRST on JF-17 could be a game changer in some respects. By enabling the pilot to switch-off his or her radar and still engage an enemy at extended ranges, IRST offers the JF-17 a reasonable opening against genuinely advanced fighters. It would allow the JF-17 to track and engage an opposing fighter without giving away its position, in addition to greatly dampening the effect of the opposition’s EW jamming. If the battlespace that the friendly fighter with the IRST installed is fighting in is ‘networked,’ where a whole range of different assets (other fighters, AWACS, ground or surface radars and so on) are sharing a common sensor “picture” via data-link, that IRST equipped fighter could still maintain a synthetic radar “picture” of airspace around it while keeping its radar turned off. This would allow that fighter to retain an incredibly high state of situational awareness, while still remaining electromagnetically silent regardless of if the enemy turns on their radar at all. For instance, an F-16 with a Legion Pod and a Link 16 data-link terminal installed could use an E-3 Sentry’s radar picture to intercept an enemy fighter that is too afraid to turn on its own radar. Once in range of its IRST it can then prosecute the intercept and kill on its own, including a final weapons-grade firing solution. Basically, third-party sources are supplying the F-16 with the ‘big picture’ and once it is looking in the right direction it can use its IRST to shrink that picture down and enhance its targeting fidelity to a lethal level without giving away its own position via using its radar. The basic point being made by Foxtrot Alpha is that an AEW&C, such as the Erieye or Karakorum Eagle in the PAF, could use its very powerful radar to detect enemy aircraft, and then it could pass that data to the IRST-equipped JF-17. The JF-17 at this point would have its radar switched-off (making it more difficult for the opposition to know if it is around), but it would know – in real-time – about the incoming threat from the AEW&C. When the time for engagement comes, the JF-17 pilot can launch the SD-10 to reach preprogrammed coordinates or waypoints on the way to its eventual target, and once in position, the SD-10 can switch-on its radar-seeker and seek the target. The window for escape for the enemy could be very short (as the RWR would only pick up a radar signal from the missile when it hits terminal stage). Alternatively, the PAF could even take the MICA-IR route by pairing the SD-10 with an infrared seeker, thereby enabling it to be a completely silent threat. IRSTs can not only work well for US and allied nations combat aircraft, they can also work well for an enemy that has much less advanced fighter aircraft, but has upgraded those fighters with relatively cheap new subsystems. Electromagnetic silence, when paired with other aircraft using dissimilar tactics, such as active radar scanning, data-links and jamming, against a more advanced fighter force, can give that less advanced force a fighting chance at having a number of aircraft “break through” the more advanced enemy’s fighter screen. If that same less advanced force were equipped with IRSTs, they could work more independently with a greater chance of survivability against a non-IRST equipped, but more advanced fighter aircraft. The big risk here is that countries can take old and fairly crude fighter aircraft and bolt on some pretty wicked systems, at relatively low cost, to help level the air-to-air playing field. I expect the PAF’s approach to IRST will be very similar to what the U.S has done, i.e. find a suitable IRST pod and connect it to a hard-point (ideally the chin) station on JF-17. I do not think the PAF will opt for an integrated solution built into the airframe, the JF-17 is too small (which is the reason the PAF opted for a fixed in-flight refuelling probe). Moreover, a solution built into the airframe will add to the per-unit cost of the fighter, the PAF would probably prefer being able to buy the pods separately and allocate them according to the needs of specific JF-17 units. Overall I think it is fairly apparent that the JF-17 is still managing to flow on-track (with JF-17 Block-2 in production), though I do wonder if the advances – and tandem cost increases – of the Block-3 will make matters a bit trickier for the PAF. That said, the potential at hand should not be underestimated. EDIT: Adjusted bit about the Erieye using Link-16, not confirmed.